Checks with U.S. retail sales channels conducted by Canaccord Genuity technology analyst Michael Walkley found that the iPhone 4 is "by far" the top selling device at both carriers AT&T and Verizon. But Apple's older devices have also found great success. "Interestingly, our April checks indicated continued strong demand for the iPhone 3GS at AT&T and iPad 1 at Verizon, as these older generation products with reduced prices often outsold new Android products," Walkley wrote in a note to investors on Monday. "We believe this highlights Apple's significant competitive advantage, and these older products help Apple offer a tiered pricing strategy at key channels." Checks with Verizon stores found that the 16GB and 32GB versions of the first-generation iPad sold out in less than two weeks after the iPad 2 debuted. And at AT&T stores, the $49 iPhone 3GS outsold newer phones like the HTC Inspire and Motorola Atrix. Checks with stores found that new Android smartphones were largely gaining share from Windows 7 smartphones, but not the iPhone. Walkley also expects the iPhone to remain the top selling handset at Verizon throughout 2011 as upgrades continue, partially because the carrier is not allowing subsidies to customers that are still under a two-year contract. Walkley also found that the iPad is by far the best selling tablet, while competing products like Research in Motion's PlayBook or the Motorola Xoom have had "modest sales." "Longer term, we believe Apple's ramping iOS ecosystem will lead to a stronger replacement sales cycle, and this should help drive strong longer term earnings growth," he said. 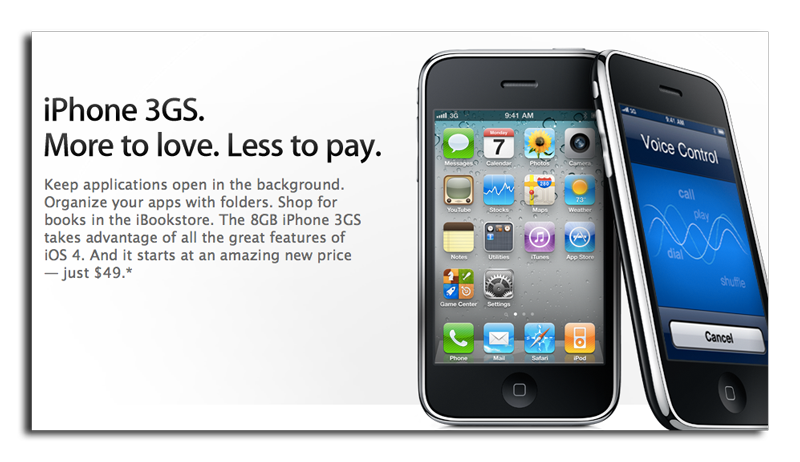 Starting with the launch of the iPhone 3GS, Apple began selling the previous year's smartphone model in the U.S. for $99 with a two-year contract. This January, the price of an on-contract low-end iPhone dropped even further, to $49. Collectively, smartphones running Google Android have surpassed the iPhone in terms of units being sold, due to the multitude of Android-powered devices from numerous manufacturers. No individual smartphone model has been able to compete with the iPhone in terms of total unit sales, however, helping to push Apple to record sales of 18.65 million iPhones last quarter. Apple also heavily discounted the first-generation iPad after the iPad 2 was announced, with discounts starting at $100 and increasing even more over time. Similar deals were also offered by AT&T, which sold the 3G-capable version of the first-generation device, and Verizon, which sold the Wi-Fi-only model bundled with a MiFi 3G hotspot.